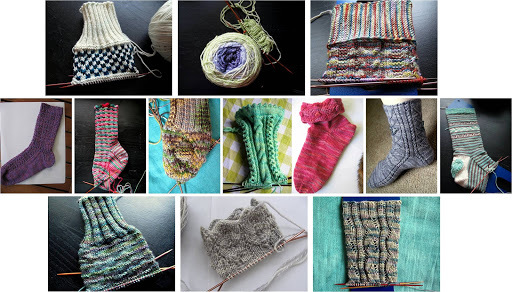 There is a different KAL every month in the Sock Knitters Anonymous group, but in August they do a great finish-it-up KAL where the goal is to finish as many pairs of socks as possible that had been started prior to July. The goal of finishing up those lingering second socks is particularly attractive to someone with a chronic unfinished-sock-problem, like me. Dudes, some of those SIP (socks-in-progress) photos were taken three apartments ago. Granted, not all the photos are up to date, many of the socks are further along than they are shown here, but still. I think I need this KAL, don’t you? There is a sea-themed KAL occurring on the Cephalopod Yarns Ravelry board. There aren’t many rules for this one, the idea is just to knit some yummy CY/SG yarn into some interesting, oceanic patterns. I’m planning to knit my Dissipative cowl pattern in some of their merino/alpaca/silk blend aran-weight yarn, Beastie, when it arrives. This yarn is not Beastie, it’s Malabrigo. Syrinx Shells could work for this KAL, too, if you used their Traveller yarn held double or triple to get a super bulky weight. It would also work as a thinner, lighter-weight scarf with two skeins of Beastie. Check out the KAL thread for all sorts of neat nautical patterns. Do you enjoy KALs? Do you find they help you finish projects or do you end up just starting more to take part in them? Have you been inspired by something lately? Link along below and let us know! Inspiration Saturday is for sharing whatever has been sparking your creativity this week. Come play along! This entry was posted in InspirationSaturday, KAL, socks by shoelaceswitcher. Bookmark the permalink.